WORK on the Heysham to M6 Link Road will begin in the New Year after a final attempt by objectors to derail the scheme was thrown out by the Court of Appeal. The link will provide better access to Morecambe and industrial areas which include the Port of Heysham and the Heysham power stations. It will also reduce congestion in the Lancaster area, particularly on Caton Road, Morecambe Road and the Greyhound and Skerton bridges. The decision clears the way for Lancashire County Council to start building the £124.5m road linking the Heysham Peninsula to the M6 motorway, heralding a new era for economic growth and improved transport. It has long been one of Lancashire County Council's top priority transport schemes, with development consent being awarded in March 2013 following a lengthy process that included a six month examination period with 3 weeks of public hearings. Campaigners against the link road, Transport Solutions for Lancaster and Morecambe (TSLM), had requested permission to apply for a judicial review to challenge the decision by the Secretary of State to grant approval for the project. Following a two-day hearing held in July, a judgement was issued by the High Court in October, which rejected all five grounds put forward for the challenge and refused TSLM permission to make the application for judicial review. TSLM made further applications to the Court of Appeal, asking for the High Court's judgement to be overturned. The last of these was made today during an oral hearing, when the judge again refused the application. County Councillor John Fillis, cabinet member for highways and transport, said: "We've always been confident of the case for the link road, which is widely supported by local people and businesses, and I couldn't be more pleased that we can now get on with building it. "The road will provide excellent value for money in terms of considerable benefits for local traffic, businesses and employment, while acting as a catalyst for wider economic growth. "Whilst I'm very satisfied at the strong judgement in our favour, I'm also extremely frustrated that objectors have cost the people of Lancashire an extra £2.6m by pursuing what amount to no more than delaying tactics. "I went to see the depot being constructed earlier this week, and I'm looking forward to seeing work on the road itself start in earnest in the New Year." Lancashire County Council's contractor Costain recently began constructing an area to accommodate staff, offices and equipment needed to build the link road at an army camp on Halton Road leased from the Ministry of Defence. The depot is scheduled to be completed in time to allow work on the road to begin in January. The new road will complete the long awaited connection from the Heysham and Morecambe peninsula to Junction 34 of the M6, and will be a 4.8km dual carriageway with a footpath and cycleway along the entire route. The project also involves a fully remodelled junction 34, with new slip roads, a new bridge over the River Lune and a 600 space park and ride site. 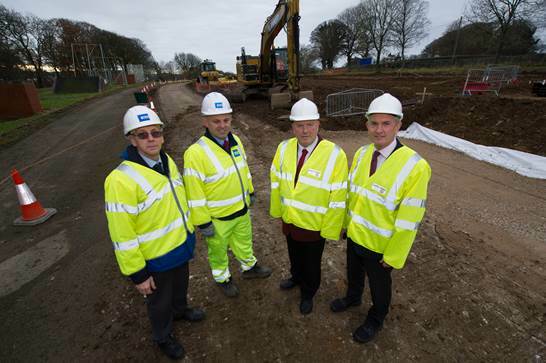 The new road will provide better access for residents, businesses and tourists to the area. As well as easing congestion, the link road project features a number of associated improvements including a park and ride scheme with buses running from the park and ride site into Lancaster city centre, and bus priority, cycle and walking measures. The link road will improve access to Heysham Port, the third largest in the North West, allowing it to develop as a hub for services to Ireland. It is the supply base for major offshore gas field and wind farms. The road would also improve access to a possible third nuclear power station. Road access to the port, which specialises in roll-on roll-off freight, is currently severely congested and unreliable, acting as a barrier to further growth. The scheme will bring ongoing regeneration benefits, with 3,000 people due to be employed during construction alone. Up to 100 local unemployed people will receive training and jobs during construction. A study has predicted that every £1 invested in the link road will earn £4.40 for the economy. The contractor Costain has been selected to construct the road and has been in discussion with local firms for some time. Andrew Langley, Costain project manager, said: "We are just looking forward to getting started on the construction of the new road. We have already engaged with several local companies, and have already started the local employment and training programme." An additional benefit of reduced congestion will be improved air quality, and the scheme includes a number of measures to protect the environment by improving wildlife habitats, tree cover and watercourses. Terms have been negotiated with Costain that gives an estimated construction cost of £124.5m. The Department for Transport has said it will contribute £111m and Lancashire County Council will fund the remainder.